I picked up my daughter’s yellow spring jacket and felt weight, heaviness where it shouldn’t be. Clearly she had stuffed her pocket at the park with her latest treasure. Curious, I slipped my hand into her pocket and pulled out . . . a rock. Two rocks actually, one for each pocket. They weren’t gems, either. No sparkles or beauty. No monetary value. 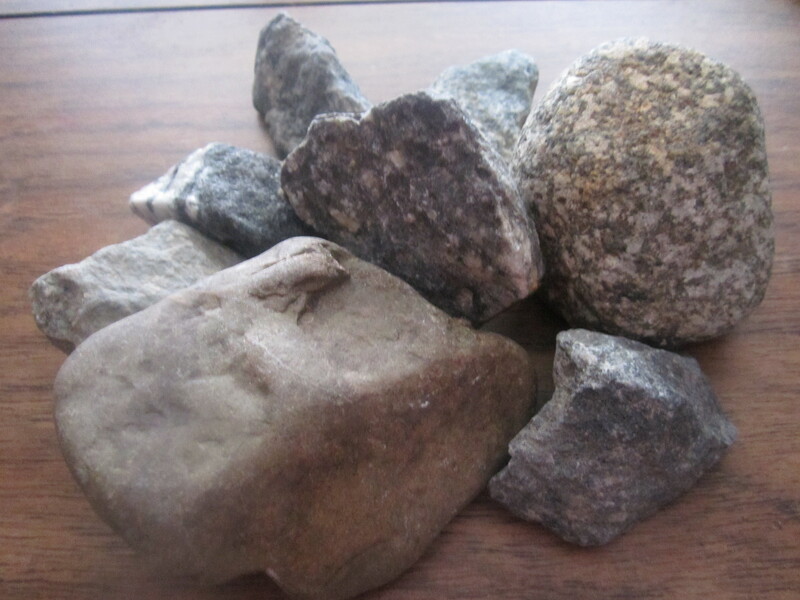 They were plain ordinary gravel, no different than the layer of rock on my driveway. In fact, the one crumbled into my fingers with the slightest pressure. I sighed. She had been toting home rocks for about two years now. Everywhere we went, some pebbles, gravel, or smooth stones caught her attention and ended up in her pockets. She has even tried to remove stones from the paths at Colonial Williamsburg and the zoo and once tried to haul away a cement block from the local museum where its grand function was to hold open the door. I put my foot down about those. But if it fits neatly into the pocket of her jacket, she’s likely to tuck it away and add it to her “rock collection.” Perhaps she’ll even give it a name, which usually ends up being something like “Rocky” or another equally creative moniker. To me, they are plain, ordinary, maybe even ugly rocks. To her, they are treasured collectibles. She’s not the only one who finds beauty in simple stones. God loves them, too. As they crossed over the Jordan River, the Israelites obeyed God’s instruction, picking up 12 stones from the river bed and lugging them up the embankment onto dry land. God told them to use those stones to build an altar. Their peace offerings and sacrifices, their worship and rejoicing before the God who had carried them into the Promised Land, may have seemed more fit for an altar of finest gems. Perhaps their greatest artisans could have finely cut diamonds, emeralds and rubies into an altar fit for worship of the Most High God. Or, if they had to use river rocks, at the very least they could have chiseled and carved until the altar looked like a marble statue. Yet, God was clear. Stones, simple stones, uncut by any human tool, formed the altar fit for the offerings of His people. Why did God even care about a detail so small? According to Him, “If you make an altar of stone, you shall not build it of hewn stones, for if you wield your tool on it you profane it” (Exodus 20:25). To God, human construction on the altar stones made them unholy and profane. That’s because God knew the danger implicit in cut stones and man-made bricks. The moment we begin to adorn altars with human effort is the moment we shift the focus off of the God we praise. We become idolaters. Our worship becomes profane, admiring the human talent that made the vessel or cut the stone. “ I spread out my hands all the day to a rebellious people, who walk in a way that is not good, following their own devices;a people who provoke me to my face continually, sacrificing in gardens and making offerings on bricks” (Isaiah 65:2-3 ESV). Israel ignored God’s mandate and chose instead to offer their sacrifice among garden flowers. They had rejected simple stones in favor of brick constructions. Israel wanted to worship God their own way and on their own terms. His instructions seemed superfluous and unnecessary. In the same way, God sometimes overturns our expectations of adequate offerings and suitable worship. He desires the simplicity of an obedient heart. We think He needs more. So, we hold back our offerings until they are “fit” for Him. We hide in the sanctuary pews until we have more to give. We think other worshipers, who are more talented and more rehearsed, give gifts more worthy. It isn’t, however, about being the best, most talented, or most qualified; it’s about being called. Yours is the offering He desires. There is beauty in the uncut stones of our worship. It’s never about the show, never about our own talent or training; it’s not about looking good or fitting in, or processing our worship into acceptable forms—all human additions that shift focus off God and onto human ability. Instead, it’s about responding to God in pure uncut adoration.